The Golden Stork i Haag, Nederland: Bestill nå! The following group types are not accepted by this hostel: Holiday with Friends, Junior / Primary School, Business Trip, Stag/Hen/Bachelor Party If you have misrepresented the type of group you are booking for, your booking may be cancelled by the hostel." Deposit for key - 10 EUR only cash! We offer 5 dorm rooms of different sizes and themes; The Green House, The Beach Hut, The Locker Room, The 070 (Netherlands joke, ask our staff about it) and Bierkade - a homage to our beautiful canal street. All beds have their own light and wall socket, individual storage section and luggage space, fresh linen is provided, towels and a delicious continental breakfast will only cost you a small fee. We are within SUPER easy walking distance of all major attractions; the Houses of Parliament, Vredespaleis, Kings Palace, Mauritshuis, Escher Museum and others. We are just down the road from the shopping district, both the main high street and cute back streets with boutique stores. 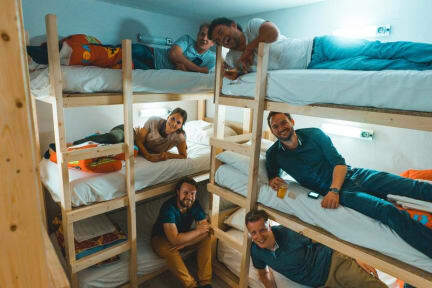 The hostel is practically inside Chinatown, a great place to head out for dinner and central to both city squares, Grote Markt and Plein, brimming with cafes, terrace bars and live music venues. Between 5-10 minute walk from both train stations and only 10 minutes by tram (the stop is right outside the hostel door) to sandy Scheveningen beach. We also run a Golden Stork exclusive and FREE city walking tour every Saturday so you have the chance to explore with a local. 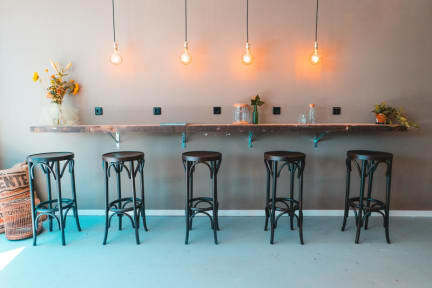 In partnership with local business we strive to bring you the best Den Haag has to offer from Wings & Roots coffee - roasted right here, to Kompaan and Eiber craft beers- brewed right here and cakes and pies made on our street by a community project bakery. Not only this but guests get exclusive discounts with a fresh, organic restaurant next door and on canal tours leaving from directly outside our front door.